Each week I welcome a guest author to share a first meeting excerpt. Today on First Sight Saturday, Richard Brawer brings us a few vignettes to capture the first meeting from his historical romance, Silk Legacy. Richard’s fun fact is that he likes to explore local history. Abe has been in Paterson for six years. He sees Sarah across the room at his brother’s wedding, but does not know who she is. He asks his brother and learns Sarah and her parents recently immigrated. He has not seen Sarah since he was 13 and she was a child of 3. She’s grown into a beautiful woman of nineteen “with a waist so narrow she would make an hourglass jealous.” Because of tradition he iss not allowed to meet her. However he does re-introduce himself to her father, his teacher in Latvia. She first noticed him across the room at her best friend’s wedding. When their eyes met and he smiled, her heart fluttered and she almost swooned. He was so handsome, so distinguished with his sweeping handlebar mustache. He carried himself straight and tall, sure of himself. …Despite her mother’s forbidding, Sarah readied herself anyway in hopes her mother would have a last minute change of heart. She put her hair up, and dressed in the white linen shirt-waist with flowing sleeves and ruffled cuffs trimmed in pink satin ribbon. “She is not feeling well,” Esther said. They fell into a strained silence, the Singers glaring at him as if he were the Tsar himself. “So soon?” Sarah asked as she swept into the room. “I’m really not in a hurry,” Abe said, a broad grin lifting his lips and springing his mustache upward. “Then you will have more tea?” Sarah asked. When Sarah handed him his refilled cup, their fingers touched. Her lower lip quivered ever so slightly. She dropped her eyes and hurried back to the couch to sit by her mother. Abe held his teacup in his lap. Sarah’s fragrance lingered around him. He wanted to continue to savor it until it evaporated. “I understand you own a pub,” Sarah said. “Yes, I do,” Abe answered gleefully. Jumping up, Mrs. Singer grabbed Sarah’s wrist and dragged her out of the room. On his way down the stoop, his shoulders involuntarily jerked at the loud bang the door made when it slammed behind him. 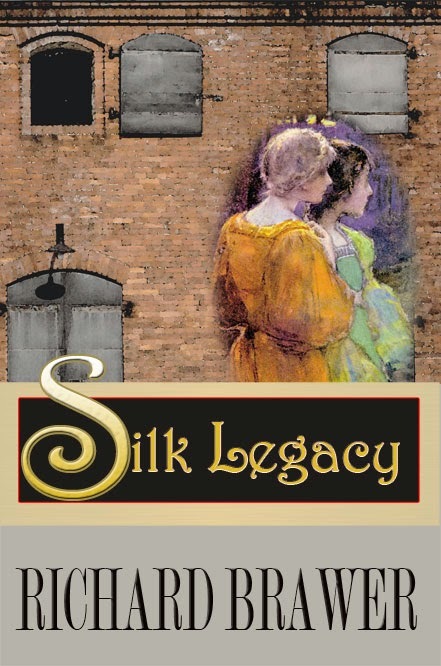 You can read the full reviews for Silk Legacy on Amazon or on Richard’s website www.silklegacy.com. Find Silk Legacy at the following vendors. Richard and I both welcome your questions and comments. Make sure you come back each First Sight Saturday for a fresh excerpt from a new guest author.